appliance up to 200W. Power up TV screens, printers, and more even when a socket's not available. You can charge almost anything you can think of. Whether it's your daily commute, vacation, or outdoor adventure, you'll have the power to get through it. activate to keep it cool throughout operation. Save even extra battery by holding the power button for 3 seconds and turning the power bank off while not in use. NEXGADGET PORTABLE POWER SOURCE: 42,000mAh high capacity, powerful enough to charge laptops, desktop PCs, TVs, lamps, phones, and even mini fridges. It boasts triple output modes: a 12V DC socket, two AC outlet (for devices up to 200W) and 4 smart fast-charging USB ports. MINIMAL SIZE & LIGHTEST: High Ratio of Dimension and Capacity. This Battery Pack May Be the Smallest for 42000mAh AC portable charger, Size Only 7.9 x 5.7 x 1.8 inches And Weight 3.3lb. 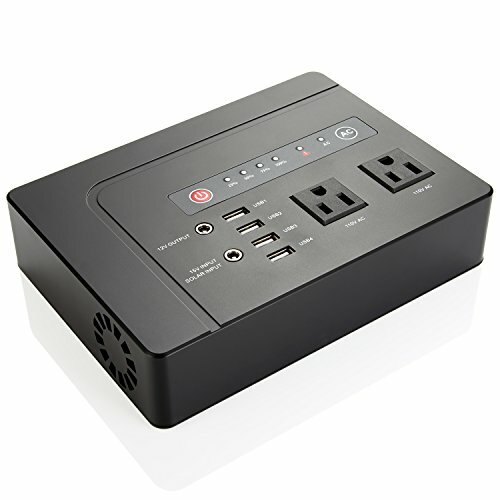 Ideal power supply for camping or emergency backup. PURE SINE WAVE: Better than modified sine wave, cleaner current in your hands. It prevents crashes in computers, reduces noises in fans, TV and other devices and it is compatible with more gears. FAST CHARGING 15V/2A DC INPUT: Recharge the power bank faster than ever with the 15V/2A DC input, only need 6-7 hours to get fully recharged and conveniently monitor the battery level via the 4 built-in LED indicators.